Veronika McLeod: Ala Prima Painting Demonstration in December! 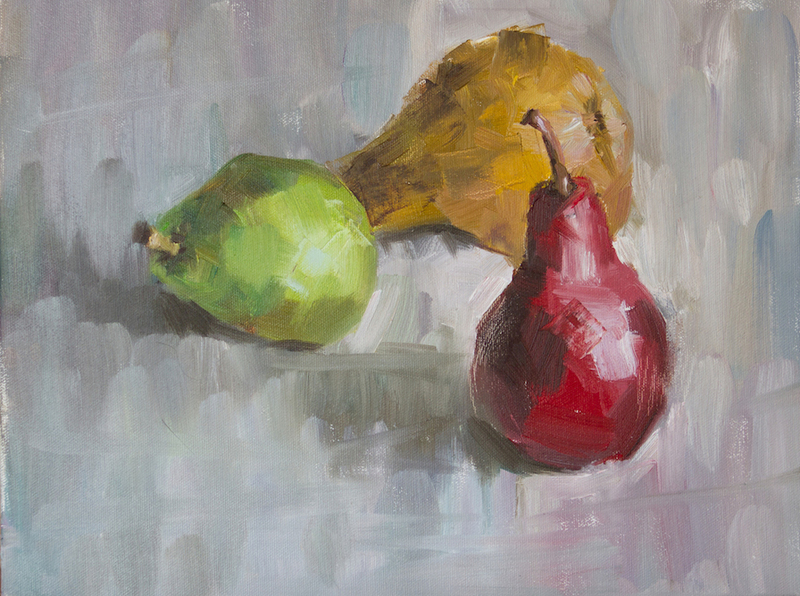 Ala Prima Painting Demonstration in December! Please, come to a painting demonstration at OPUS on December 19th. This event is free and all you need to register is to call Opus Downtown at 604-678-5889 to reserve a spot. Points on how to be ready to paint Ala Prima. Method Ala Prima is my favorite method of painting for many years. It takes one inspired moment and some concentration to be able to put all your knowledge and expression in one session. And it is worth trying. This is mostly used for doing studies for longer piece, searching for right color combinations or composition. I like freshness and life of this studies a lot! This one is called Delicious Pears. And believe me they were tasty:) They are painted during demonstration at Opus art Supply Store last year. Less than two hours and talking all the time... How difficult it seems? For many of my students it seems impossible. I say it takes some practice to pull it off right away. I am always ready to share and help beginners. 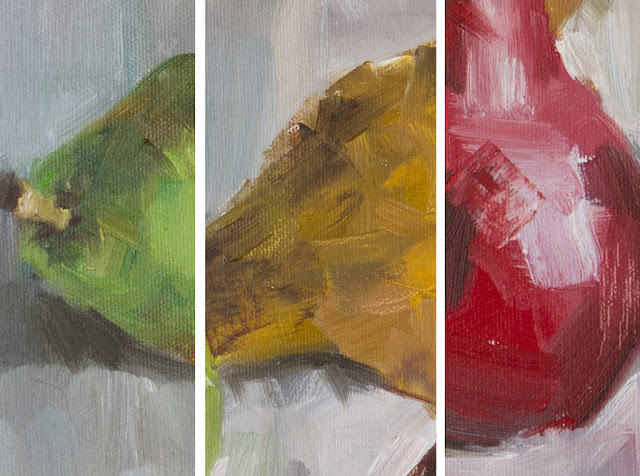 Today's tip on painting with oil is about importance to analyze your setup. So before starting to paint from observation, please, make sure to look at your objects from few angles. Notice light direction, color harmonies, and what do you know about it? I like to find 3 areas of interest, main attractions of your object. It could be: highlights, shadow shape, texture, weight, reflections, softness, hardness, angles, curves..etc. Anything which captivates you about the object or surroundings. Keep these three elements in mind the whole time, while painting. This areas are the areas to "attack" first, concentrate your attention on this qualities. It is fine if the rest of your piece is painted roughly and half finished, as long as the three main interesting things are painted well. Constantly bring yourself back to them. This pear set up I liked for its colors, light background and highlights. 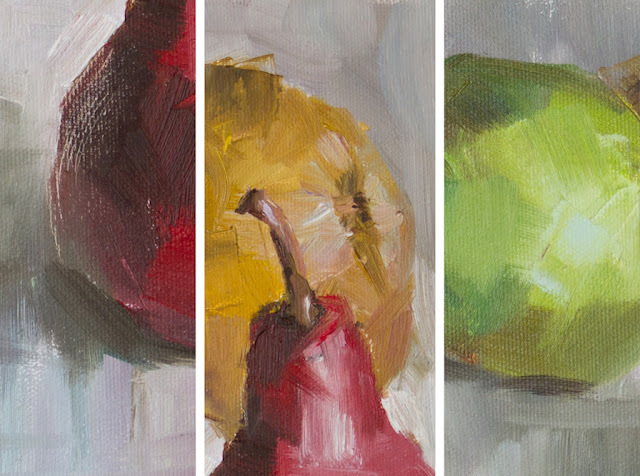 I hoped to bring all the freshness of the fruit into the canvas. One day this piece may end up in someone's kitchen and give an extra sunlight on the rainy day or uplift restless work of a housekeeper, I hope.